Large version controls up to 64 groups of indoor units (maximum 160 units). 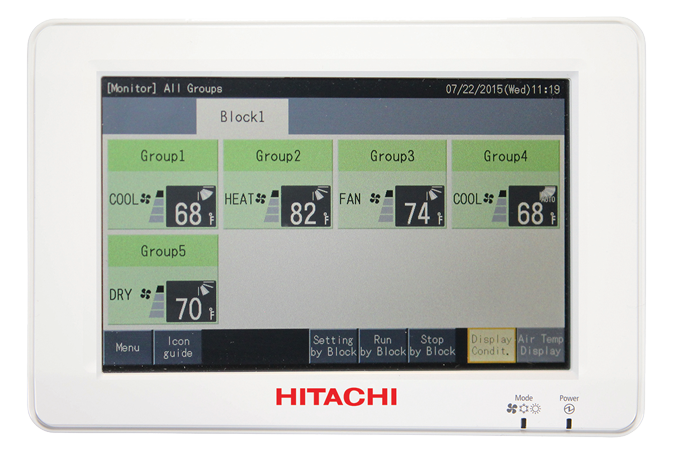 Mini version controls up to 32 groups of indoor units (maximum 160 units). Records accumulated operations time for tenant billing. Color-coded graphics or quick reference. Set up to 10 on/off times per day. Up to 8 stations can be connected to the H-Link II. In addition to basic control, such as settings for operation/stop, the operation mode and temperature, the air quantity and auto louver can be set. If a problem occurs, an alarm code immediately shows the details of the problem. © Hitachi SmartFlex. All Rights Reserved.